Richfield, OH - His Grace Bishop Mitrophan of Eastern America officiated at the Divine Liturgy on Lazarus Saturday, April 12, 2014 at Monastery New Marcha in Richfield, Ohio. Bishop Sava, retired Bishop of Slavonia was also present. Concelebrating with His Grace, the bishop, at the Divine Liturgy were V. Rev. Stavrophor Vasilije Sokolovic, V. Rev. Milovan Katanic, Hieromonk Platon (Jovic), Rev. Milan Medakovic and Rev. Branislav Golic. Lazarus Saturday is the Krsna Slava of Bishop Sava and Hieromonk Platon who, together, festively celebrated their Slava at Monastery New Marcha. 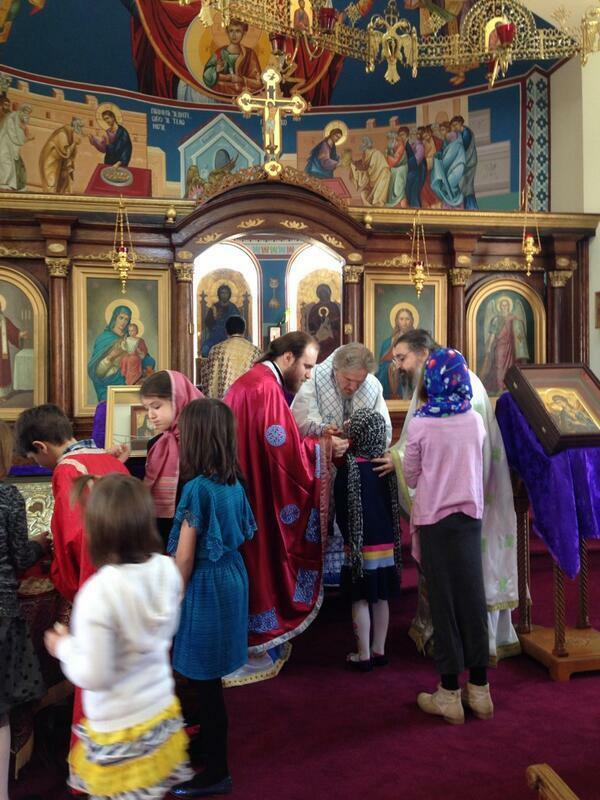 Bishop Mitrophan blessed the Koljivo and cut the Slava Kolach following the liturgy. Afterwards the bishop blessed the palms and the led the faithful in procession around the church. Bishop Sava and Hieromonk Platon welcomed their guests at the monastery trapeza for a lavish lenten Slava luncheon.